This is the first part of a series of articles on Pentagon and Energy. 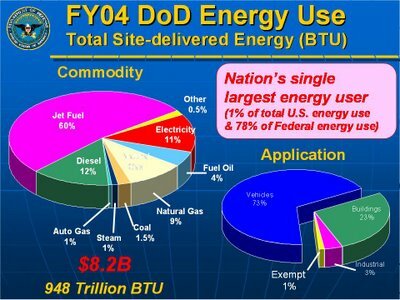 The DoD is the single largest energy user in USA (even though it is 1% of total US energy use and 78% of federal energy use). It uses 97% of all US Government liquid fuel consumed. In FY2005, DoD consumed about 5.17 billion gallons of mobility fuel at a cost of $8 billion. The distribution of energy use among the branches: Air Force 53%, Navy 32%, Army 12%, the rest 3%. Distribution of fuel use by mode: Aviation fuel 89% (mobility 49%, fighter 25%, bomber 7%, trainer 3%, other 5%), ground fuel 3%, facility electricity 3%, other 5%. 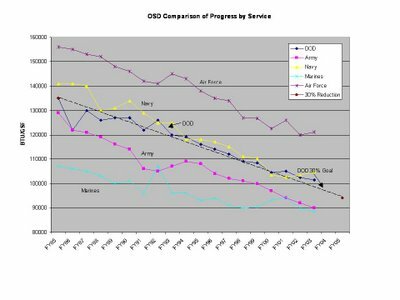 Due to this immense energy consumption, an instruction by Assistance Secretary of Defense on December 2, 1985 had established the DoD Energy Policy Council (DEPC) to provide for coordinated review of DoD energy policies, issues, systems, and programs. But it did not achieve anything visible. Things accelerated with the new energy policy act. The Energy Policy Act of 2005 promotes “dependable, affordable, and environmentally sound production and distribution of energy for America's future.” It also includes DoD’s utility privatization program, which is a public-private competitive process to save DoD unnecessary costs and to provide better services. The DoD has an energy management program, which aims at achieving the goals of the Energy Policy Act 2005 (ppt from DoD point of view) and Executive Order (EO) 13123 Greening the Government Through Efficient Energy Management. DoD Annual Energy Management Report for FY2005 (check for availability for FY2006) gives details about the program as well as achievements done. The report itself, as well as its Data Report annex is kind of a puzzle, at least to me, full of all kinds of unnecessary information with no complete picture. The DoD's energy consumption goals are to reduce the energy used in administrative and similar buildings by at least 30% by 2005 (compared to 1985) measured in BTUs per gross square foot; to improve industrial energy efficiency by 20% between FY90 and FY2005, and to implement all energy and water conservation projects that are life cycle cost effective (payback of 10 years or less). Office of the Deputy Under Secretary of Defense for Installations and Environment website has more or less all the information concerning energy and its management. Look at a summary presentation and Energy strategy memo for brief descriptions. There is even a DoD Energy Managers Handbook which is designed to help DoD energy managers understand the scope and magnitude of their job and know how to find the information and resources needed to help do that job effectively. But I think the problem is information overload, not where to find information. Why in all those paper works too much space is given to the facility energy consumption is beyond my understanding. More than two thirds of energy is consumed for mobility but it has not even 10% space in the reports. Instead, renewables get the widest coverage. Given the increasing popularity and celebrity of renewables this attitude is understandable but it is oil that is the main fuel used and will be used in the foreseeable future, even after the peak. In 2005, renewable energy (8.3 trillion Btu of renewable energy from self generation and through purchases) accounted 8.3% of all facility electricity consumption of DoD. The aim is to increase it to 25% by FY2025. However, renewable energy is still a very small part of the total DoD energy consumption. Alternative Fuels Information Station of the Defense Energy Support Center is one of the best places to have clear tutorials on biodiesel, fuel ethanol, synthetic fuels. (A must visit). Moreover, Alternate Fuels Information for Non-Tactical Vehicles, Guidebook for Handling, Storing, and Dispensing Ethanol Fuel (an exceptionally good publication on ethanol), Ethanol Safety Information Paper published by the Pipeline and Hazardous Materials Safety Administration, and Guidebook for Handling, Storing and Dispensing Ethanol Fuel are worth to read. Beginning June 1, 2005 all U.S. Navy and Marine non-tactical diesel vehicles are required to operate on a B20 (20 percent) biodiesel blend as part of the military's efforts to increase their use of domestic and clean fuels. The policy does not apply to tactical military equipment or deployable commercial equipment intended to support contingency operations. The U.S. Navy, Army, Air Force and Marines all use B20 at different bases and stations throughout the country. But the Navy is the largest user of diesel fuel in the world. According to me the DoD makes a lot of work on renewables, even too much, that is very suspicious. It is not because Pentagon loves "green" and therefore wants to go "green" but because Pentagon knows what is approaching and what it will have to face.